Introducing Cindy Rushton's NEW Organized Mom Super E-Book Set! A complete, SEVEN VOLUME E-Book Library for filled with printable pages for your planner, articles that are written by another busy homeschool mom, tips that will make remedy those little problems along the way...AND a complete AUDIO LIBRARY of E-Workshops that will inspire you more than you could ever imagine! Cindy Rushton writes, "We are asked very often what we recommend as THE one book to get if you could only get ONE. Well, this is always our suggestion! 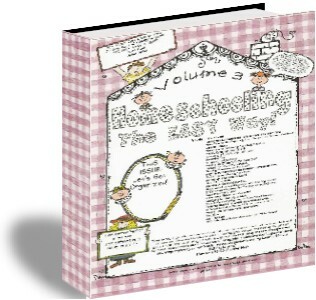 This book compiles a wide range of homeschool help--real help! You are sure to LOVE it! " "Homeschooling the Easy Way" includes over 23 chapters and 200 pages (with an additional 24 pages of printable planning sheets). This book is packed with chapters written from the heart of a homeschool mom who has homeschooled her children for over 15 years. You are sure to find idea after idea that will make this year the very best ever! Cindy, I can't say thank you enough. At this point words truly do not adequately express my heart felt thanks for taking time to write this book. You have blessed us so much. This is the first time in 7 years of homeschooling that I really feel confident that *I* can do it! This book came at the perfect time in my life. Keep up the great work! Again thank you so much. Susan C.
· Tips for teaching every subject--the EASY WAY. So that you can begin homeschooling today without all the trial and error most endure. · More than one method to choose from .Cindy gives a wonderful mixture of ideas for teaching just so you can reach your children where they are--with their interests and learning styles. You find ideas that give you the freedom to teach YOUR way to each of your children. · Techniques explained in-depth. Cindy takes you step-by-step through each technique. You find details that will make it do-able! · Written in Cindy's personal, friendly, easy-to-understand style. You won't need to purchase a dictionary just to understand what Cindy teaches. · No need to buy a bunch of additional curriculum. You can begin homeschooling with this book, a Bible, and your library card! You won't waste time and money buying resources that waste money and do not work for you. · Includes a strong focus on how to make homeschooling a LIFE--alongside of the rest of your life. Complete with help for managing all areas of life while you homeschool! You'll never need to buy another homeschooling book, as this explains everything you need to know in easy to understand lingo. that are designed to help you get your homeschool organized and on the right track! You will LOVE IT! And...we are not done yet! With over 260 pages, this E-Book is so jam-packed with great forms, you'll be hard pressed to find another resource with all this valuable information in a single publication elsewhere. Remember that this system is designed JUST for the homeschool mom! Simple, but complete! You are sure to find that this planning system will resemble your BRAIN-IN-A-BINDER! Covering areas of concern for today’s busy female brain, this one is sure to be your favorite! Plus! You can print JUST what you need and print as many copies as you need forever! Our Organization Bundle would be incomplete without this INCREDIBLE book! Bored with the same old, same old meals? Just wish you could get just ONE fresh idea? What if you could link up with over 40 other moms for menu plans... meal ideas... recipes... shopping lists... and even planner pages? Well, YOU CAN! 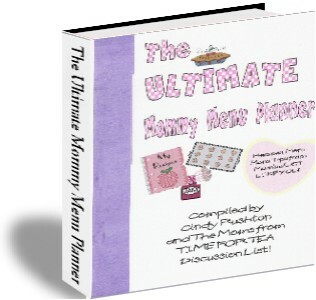 THE ULTIMATE MOMMY MENU PLANNER includes over 280 pages full of great recipes, meal ideas, and menu plans from over 40 REAL-LIFE homeschool moms, printable planning sheets, tips sure to make managing meals easy, plus much, much more! 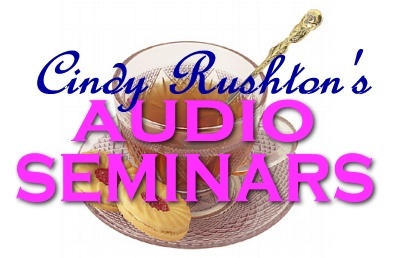 We really enjoyed ourselves atCindy Rushton's Time of Relaxation and Refreshment, where I learned just as much from her generosity as I did from her seminars. Cindy's method of homeschooling - a much more relaxed method than I'd been making myself do - is exactly what I need. WhatFlyLady did to my house (well, she made me do all the grunt work, but gave the advice), Cindy Rushton has been to my homeschooling (again, making me do the grunt work!). Three things from Cindy that I am most excited about are: 1.) Individual quiet time with God to start out our day (I've been doing this alone in the early mornings, but haven't encouraged my kids to this alone), 2.) notebooking, and 3.) copyworking instead of my previous method of an argue/beg/yell/plead session with my nine-year-old boy in an attempt to get him to write. We really enjoyed spending time with you guys at the homeschool / homebusiness conference! I've been listening through our set of the conference audios while working on orders and doing "catch up" work here... They are just excellent, chock full of great info and instruction. ( You should be charging much more for these! ) I know they're really going to help lots of folks to get where they want to go with their home biz goals. finally organize my life!!! Again, a great day!!!! Cindy - Just want to thank you for this weekend. The Romance Workshop helped me a lot. The "How to Destroy Your Man" REALLY has caused me to repent in godly sorrow for the way I have treated my husband. I am praying and seeking to have a better relationship with my husband. Just a short note to thank y'all for a great workshop on Friday and Sat. You have put in LOTS of work and we appreciate that. The manual too was a labor of love and the handouts were great. Both families were just so generous…we could see all the speakers’ desire to do everything as unto the Lord and that blessed us so much. Thank you! That was our very first workshop of this nature and you bet we are planning to attend future ones. Thank you for sharing with other homeschoolers the tricks of the trade. You are a light in a dark tunnel. Thank you for sharing true light! But that's not ALL!! There's EVEN MORE! I can't believe the difference in my homeschool for me in the past week since reading your book! You're information has truly been helpful! Please add me to your ezines so I don't miss ANY articles. Anna T.
Oh! This bundle would not be complete without sharing a bit of our home with you. This book does JUST that! We are SO excited to add our NEWEST E-Book to your organization set! You will LOVE this book! Our best-selling book, Christ-Centered Christmas has recently been TOTALLY revamped and expanded into a huge manual! Need fresh ideas for making your holiday season special? OR for cooking every day? Looking for fun and (VERY)easy recipes that will never tell that your favorite menu is take-out? Ready for a whole bunch of FUN ideas for your family memories? This is a book that you simply CANNOT miss! PLUS! We have EXTRA BONUSES! We have an AMAZING list of audios for JUST FOR YOU! 10 Fun and Easy Ideas for Making Homeschooling Great! Organization 911! Help for the Messy Mom! I have been listening to the audios I bought from you and I just had to tell you what a blessing you have been to me. We have had a very long and difficult year and I was just ready to quit. I was seeking the Lord every morning and just crying out to Him. I had lost the joy in being with my children (3 girls). They are great and well disciplined but I had stopped focusing on what wonderful people they are and instead I was focusing on the work that was not being completed or not being done correctly. I was believing they were lazy and not motivated. I have been taking that love for learning from them by being overly critical. God has just spoken so clearly to me through your messages and His word. My husband came up with a family theme this week: Ephesians 5:19-20 "Be filled with the Spirit, speaking to one another in psalms and hymns and spiritual songs, singing and making melody in your heart to the Lord, giving thanks always for all things to God the Father in the name of our Lord Jesus Christ." Although we're at the end of our school year we're going to go out with a "bang" and get them stirred up for real learning. By the way we are going to be blessed with another baby in December. Thanks again Cindy for being a vessel God can use and for sharing your love for Him, your family and homeschooling. I love ya and haven't even met ya! I believe this weekend was a true encouragement to everyone in my family. The kids really enjoyed hearing Matthew speak on purity, business and homeschooling. At lunch today, my middle daughter shared stories she had heard from Matthew about successful entrepreneurs…they all had a small business as a child. I expect great things from Matthew! The retail prices for all of these items individually is $174.85. Use the SECURE order link below to order. NOTE: All of the books The Organized Mom Super Set are E-Books in electronic format. Each is compiled in .pdf format and are compatible with both Windows and Mac systems. All of the audios are available to download in Mp3 format or to listen online--whichever works best with your system--you get both! Just as soon as we receive your order, we will send you an email confirmation that includes links to all of your library. You can read online or your E-Books and audio workshops immediately! Order your set right now -- and in just minutes you'll have access to all these manuals and their power-packed strategies and techniques to help you get your homeschool organized today. P.S. Listen -- If you really are really wanting to make this year the best year yet, you truly cannot afford NOT to have this exclusive E-Book library. We guarantee it will be worth MANY times its cost to you, or we wouldn't be offering it to you. Make this small investment in yourself and your family's future -- and you'll soon reap the benefits of a homeschool that is a complete delight!